When Ronen was growing up in Rishon L'Tzion, South of Tel Aviv, his neighborhood, he remembers, was almost entirely made up of Yemenite families. "There was one Moroccan family" Ronen remembers, "but other than that, we were all Yemenites." The majority of the Yemenite community in Israel came from Yemen in the years following Israel's War of Independence of 1948. Walking for weeks through Yemen to Adam, the community was airlifted to Israel "On the Wings of Eagles", El Al's first airplanes, and that became the name of the operation, "Canfey HaNesharim". Everything about the Yemenites was different compared to the Jews who were already living in Israel, but nothing intrigued the Israeli Jews more than the Yemenite way of cooking. "It's because " Ronen says "everything that our mothers cooked, everything that my mother cooked, was cooked with love." After traveling pretty much everywhere that one could travel in the world - America, Europe, Africa, and Asia - Ronen returned to Israel and started to think about how he wanted to raise his own family. "I wanted to find a way to make a living that would allow me to flourish spiritually and physically" says Ronen. I knew that I wanted to introduce people to my culture, and decided that the best way that I could do that would be through food....food for the stomach together with food for the spirit". Two years ago, Ronen set up a little "fast food" stall in Tzfat's Old City, offering Yemenite delicacies to tourists and locals. 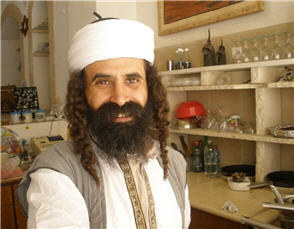 While he flips lachuchs, Yemenite pancakes which are fried with vegetables and Yemenite spices and herbs, Ronen dispenses Jewish knowledge and lore to his customers. "I want every Jew who walks in here to see that God is walking with them" Ronen explains. "I want them to feel pride in their heritage, and the connection that a Jew has to Israel". "What is Abara Cadabra"? Ronen asks rhetorically. Throughout the world, everyone knows that it's the 'magic words', yet few know that it comes from Aramaic. 'Abara' means 'as I create' and 'cadabra' means 'as I speak'. We create through our speech. If we speak well and properly, we create a good reality. If we speak good, G-d creates a good reality for us too." "What is 'Yitzat Mitzraim'? The Exodus from Egypt. 'Mitzraim', Egypt, has the word 'tzar' in it. That's narrow. The Jews went to the 'midbar', the desert. 'Midbar" has the word 'dibar' in it, 'to speak'. So in the Exodus, the Jews went from narrowness to speech, to creation." All this is delivered in rapid-fire Hebrew, with seemingly no effort as Ronen quickly whips and flips his lachuchs, malawachs, and Jachnuns for the tourists, who seem as stunned by his teachings as by the incredibly tasty food that they walk away with. "Food for the soul and food for the stomach" is Ronen's motto, and few would disagree that that is exactly what his customers receive.